Falcon Electric’s ED Series is more than an international voltage/frequency converter, voltage regulator or line conditioner. Its unique features will significantly improve your equipment’s reliability, virtually eliminating power-related downtime and dramatically increasing productivity. Its small size and lightweight construction makes it ideal for OEM and integrated applications. Since the ED Series is a solid-state generator, it prevents daily power disturbances from reaching your equipment. Constant voltage transformers, line conditioners and other devices are not designed to prevent damage from these problems. 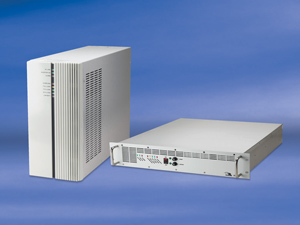 The ED continually regenerates new, clean AC power in pure sinewave form for superior protection. Even with wide input variations in voltage and frequency, the ED Serie’s output steadfastly remains at its designed voltage and frequency. It also allows your system to continuously operate during extended brownouts to 88 VAC. Falcon Electric’s ED Series is designed to start loads that exhibit up to 1000% inrush current when started from utility. This gives the ED the ability to start tough loads such as motors, multiple computers or incandescent lighting. Due to its Regenerative On-line design, the ED Series will regenerate new, clean computer grade power with tightly regulated voltage and frequency, independent of generator voltage and frequency drift.